Amazing Investment Potential! Large 6 bedroom Heritage Style home plus 3 one bedroom legal suites on the lower level! Lots of beautiful heritage features. The main part of the home is on two levels, 5 bedrooms above, with a large, dry, attic/storage space. Separate living and dining room, den/parlour, and another bedroom on main floor. Hardwood floors on the main levels, bedrooms with large windows, fabulous views. Water filtration system. Large covered deck to enjoy summer living. All the suites are ready to rent out. 2 suites with split head/air con. Greenhouse on its own cement pad, 2 other metal sheds. Even though this home is on Hodgins, it feels very private and quiet. This was the original Nurses residences! 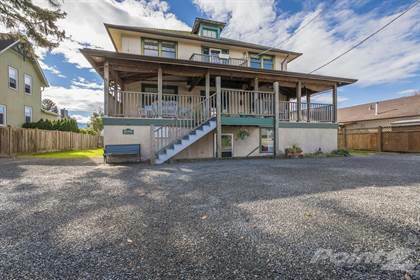 Call today!\r\rNeighboring property MLS #R2323558, 45370Hodgins Avenue also for Sale. Hi, I'd like to find out more information about 45356 Hodgins Avenue . Thanks so much!